Keenspot • View topic - HOLLY ****!!! Wow, that's completely unexpected... but this isn't Snake's first Smash Bros style game appearance though, he was in DreamMix TV: World Fighters... which was Konami/Takara/Genki/Hudson's attempt at a Smash Bros game... which never made it to America. I actually mentioned it a while back in the Moru wedgie comic. Still I find this very interesting, perhaps other classic NES characters that aren't Nintendo made will make it into the fray... if Boy and his Blob are in I'll crap myself. Now, see, I had an avatar, but it was too big for this forum(2 kb, bah!). But I'm too bloody lazy to make it smaller. Another surprise (for me atleast) was the inclusion of the now awesomized airship from the Kirby series "The Halbird" (atleast I think that's what it was called) seeing as it's been what? 10 YEARS!? I mean,will over 50% of the players know what they're fighting on!? Lightning Rod of Hate wrote: Another surprise (for me atleast) was the inclusion of the now awesomized airship from the Kirby series "The Halbird" (atleast I think that's what it was called) seeing as it's been what? 10 YEARS!? I mean,will over 50% of the players know what they're fighting on!? I think it was called Halberd. If Rock and Sonic are included, this game will own everything. I thought Samus wore a two piece outfit under her armor. Was I mistaken? No bikini underware in this one. I'd hope that you could use snakes combat knife to kill pikachu and get a field ration. It seems fair. In Super Metroid, she did have that Black two-piece that you saw when she exploded, but in the GBA games, she wore the blue onesy. At least she did in Zero Mission, I can't remember what was under the Fusion Suit. And in Zero Mission, there's a part where she removes her suit, then gets shot down, and you have to stealth your way through a Space Pirate ship wearing the blue "Zero Suit" with only a stun laser. I'd prefer not to be distracked by the character I'm playing while playing Smash Bros. As a matter of fact, the only thing I remember doing while playing the Melee demo at wallmart is using the pause menu camera options to look up Peach's dress. I don't want to do something like that to Samus, I respect her. 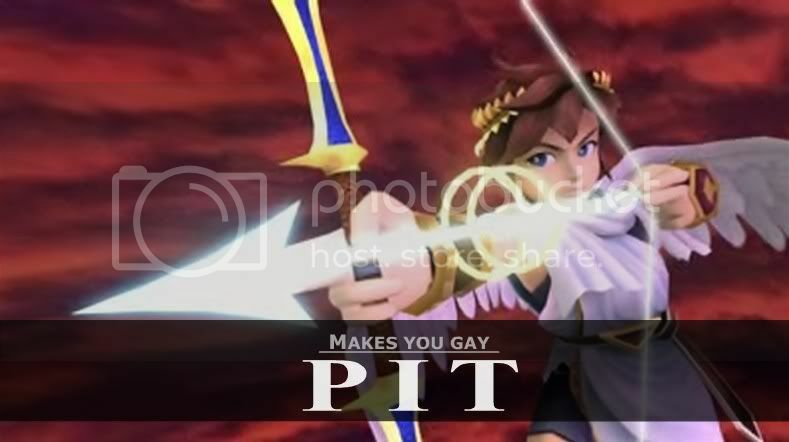 I too have a fondness for pit, so much so I made this image. Actually.. the Samus they are using in the Trailer is from the Zero Mission Game. I don't believe in any other previous Metroid games, did Samus ever appear in this suit. army "work together" type game(kind like battelfield although your one person at a time other help u! ): it's fine as long as he's being ordered to! rpgs: maybe! that idea is about as good as puting lara craft in an rpg element game...which they did!